Though much too easy, Dead Rising 4 is sandboxy zombie-killing adventure that recaptures the series' fun. What is it? A sandbox zombie slaughterfest with filled crazy weapons and eyerolly one-liners. Multiplayer: Yes, with up to 4 players, but only in a specific setting. Zombies often herald the end of all things, but for Frank West, their reemergence marks a new beginning. Frank, former photojournalist extraordinaire, has been off the radar since the first Dead Rising a decade ago, and this third Christmas-themed sequel finds him eking out his days as a college professor teaching novices his craft. But when the dead come, he again finds life. Even in Frank's opening nightmare in which he knocks back zombies like a wrecking ball, there's a sense amid his snarky complaints that he wants this. And even though Capcom's approach here stumbles here in parts, I was surprised by how much I wanted this as well. When Dead Rising 4 works, it's because it steadfastly refuses to take itself seriously. Frank is 16 years older now and looks and grumbles (thanks to a new voice actor) a little like Joel from the PS4's The Last Of Us, but even though he journeys back to fictional Willamette, Colorado with student Vick Chu, the lightweight but enjoyable tale is never weighed down with musings on surrogate fatherhood and hope. Neither is it entirely dismissible, even though it largely dumps the main conspiracy premise a handful of chapters in, as it handles its characterizations well. Frank drops lines about setting his balls on fire and other wisecracks, but there's enough gravity mixed in with the goofiness to make the relationships seem believable. The melee controls are satisfying and intuitive, although the removal of throwable melee weapons stings bitterly. Still, this is a tale about blasting zombies with a gnome-capped staff called the "Gandelf" and gleefully plowing through literally hundreds of zombies in a city park with a lawnmower. It's about strapping on hulking (and rare) exosuits after zombies overrun the Willamette Memorial Megaplex after Black Friday and cutting down them with an electrified battleaxe or using blueprints to make quirky weapons like an "Ice Sword" from scattered items like liquid nitrogen and machetes. The melee controls are satisfying and intuitive, although the removal of throwable melee weapons stings bitterly and ranged weapons suffer from poor aiming. Never before has the series tossed the undead at you with such relentlessness. I'm inclined to believe there's no way a town like Willamette was home to that many people in the first place, but the crowds make the yuletide slaughter consistently enjoyable. Frank's ability to handle those swarms comes with a price. 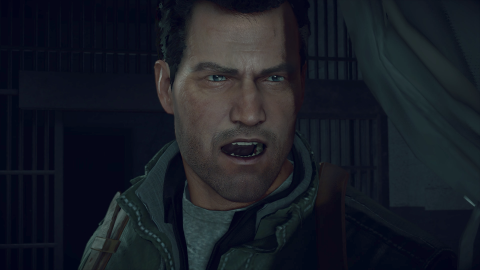 Dead Rising 4 is never difficult, and even in a toque blanche and chef's whites I could shrug off piles of the undead about as well as Overwatch's Reinhardt might fend off a pack of yorkies. When I died and had a chance to check out the generous checkpoint and autosave system, it was only because I'd stepped away and forgotten to pause. There's not even a way to ramp up the difficulty besides sticking around for New Game+ or a separate multiplayer mode that's confined to a specific setting and steadily increases the difficulty. But even in the New Game, Frank can handle himself just fine. If you're specifically looking for a single-player combat challenge or any degree of tension, you won't find it here. I could never shake the feeling that Dead Rising had sacrificed much of its identity. But you might find cause to stick around if your interests lie elsewhere. Capcom removed much of the series' previous urgency by ditching the timer, which frees up Frank's time to track down a sleigh's worth of blueprints and assorted collectibles, as well as stopping off from time to time to save survivors stranded in the undead sea. So heavy is the sandboxy exploration emphasis that Frank doesn't even have to head anywhere to craft his sometimes silly murder devices: he can cobble together firework-shooting crossbows or electricity-shooting go-karts right there in the field. The approach works well because the small-town setting is so well-realized, partially thanks to its Christmas theme that infects the core 10-hour story as thoroughly as the sickness infects the zombies. The holly jolliness adds a touch of flavor to exploring parts of town beyond the mall that might come off as boring during any other season. There's so much to see, so many parts to use for an impressive variety of weapons, and so many combos to build that I usually had a cozy sense that I was in a zombie-themed take on Just Cause, taking similar pleasure in causing mindless mayhem with weapons and vehicles to the tune of "O Tannenbaum" and "Auld Lang Syne." Frank's camera even adds to the fun, not only by taking great shots to build a few extra experience points, but by stopping to take goofy selfies with the shambling corpses. It all makes for a nice change of pace, but I could never shake the feeling that Dead Rising had sacrificed much of its identity in the process. It's the kind of design that might scare off veterans but bring in fresh zombie killers into the fold. Weirdly, there's no co-op option for the campaign, thus robbing the series of a big degree of its former fun. Gone, too, are the cutscenes that uses to boot up before what used to be called the "psychopath" minibosses. Capcom calls the psychopaths "maniacs" now, and they're sadly essentially irrelevant, being almost exclusively limited to sidequests and usually involving little more than regular zombies with big health pools tromping around in exosuits or Santa costumes. Sometimes I found welcome surprises in the form of fast, newly turned zombies, but most of the time the thousands I killed were as indistinguishable as bricks in a wall. It's a strange game for the series, as it subtracts something for everything it adds, making it unlike anything we've seen for Dead Rising until now. It's the kind of design that might scare off veterans but bring in fresh zombie killers into the fold. But it's one that I generally enjoyed, even though it's marred with a first-launch crash bug that Capcom warned us about, but which it still hasn't fixed. For some players, though, I imagine that bit of bootup trouble won't prove as annoying as the fact that you can currently only download it for PC from the Windows Store. A Steam version is supposedly in the works, but by the time we see it, Dead Rising 4's cheeky Christmas theme will likely be long out of place. But now? 'Tis the season.